For sensitive determination of NAD and NADH and evaluation of drug effects on NAD/NADH metabolism. Direct NAD/NADH Assays in 96-Well PlateNEW!!! • Sensitive and accurate. 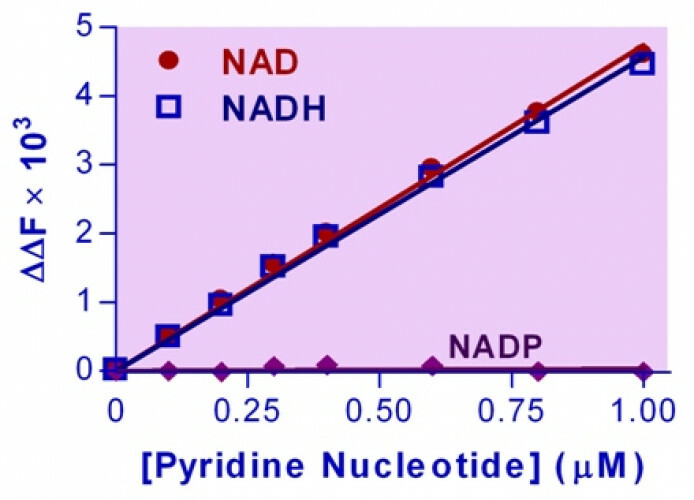 Detection limit of 0.02 μM and linearity up to 1 μM NAD+/NADH in 96-well plate assay. • Convenient. The procedure involves adding a single working reagent, and reading the fluorescence at time zero and 10 min. Pyridine nucleotides play an important role in metabolism and, thus, there is continual interest in monitoring their concentration levels. Quantitative determination of NAD+/NADH has applications in research pertaining to energy transformation and redox state of cells or tissue. BioAssay Systems’ EnzyFluo™ NAD+/NADH assay kit is based on a lactate dehydrogenase cycling reaction, in which the formed NADH reduces a probe into a highly fluorescent product. The fluorescence intensity of this product, measured at λex/em = 530/585 nm, is proportional to the NAD+/NADH concentration in the sample. 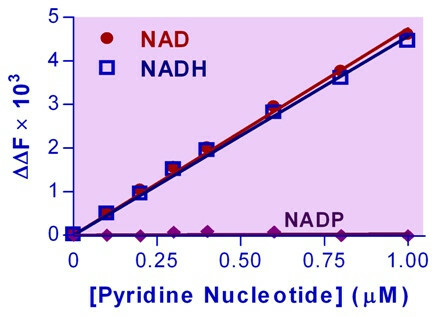 This assay is highly specific for NAD+/NADH with minimal interference (<1%) by NADP+/NADPH and is a convenient method to measure NAD, NADH and their ratio. Applications For sensitive determination of NAD and NADH and evaluation of drug effects on NAD/NADH metabolism. Direct NAD/NADH Assays in 96-Well PlateNEW!! !